Here’s to Stuart. Our love. Gone too soon. We miss you terribly. And always will. You were the green in our beans and the stuffing in our toys. You were the stalker of all squirrels and a menace to all mice. You put the chipper in chipmunk, and the Happy in Valentine’s Day. Give us a sign dear one, just so we know you’re still with us in the strongest of all spirits; you, Stuart, the most stalwart of all Scotties. 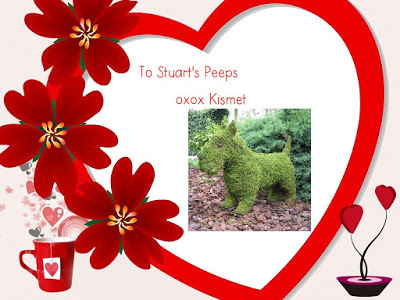 This entry was posted in dog photography, dogs, grief, love, pets, Scotties, scotties and chipmunks, Scottish Terriers, The Scottie Chronicles and tagged loss of a loved one, loss of a pet, mourning, mourning the loss of a pet. Bookmark the permalink. Stuart is watching us all I’m sure – especially you – his beloved family. A whisper of a breath on the cheek out of nowhere…..the pressure of a “lean-in” on your leg…..he’s there – always and forever I’m PAWSITIVE! You have described the essence of Stuart beautifully. His spirit is not far as his love is with you today and everyday. Never better said. His love for his Peeps was unlimited and vice versa. Beautiful. We are sending love to you today, because of wonderful Stuart 🙂 Happy Valentine’s Day. Stuart will send a sign. Possibly a visit from Sniglet will hasten the reveal ? Much love to you on a day that we really don’t know how to deal with either. We miss you Stuart. We wish that your family is able to have a HAPPY VALENTINES DAY. You are our sweet Valentine, Sweet Stu, Now and forever! Your Peepstress described you to a T! You are the best! Stuart will always live on in all our hearts. I am sure he is always watching over you guys!